There are many different referencing styles used for academic and non-fiction writing and each one has slightly different methods of presentation. Continuing our look into some of the main styles (such as MLA, APA and Harvard covered in recent blog posts), today we begin the first of two blog posts looking into the reference formatting style of The Chicago Manual of Style (CMOS). The Chicago Manual of Style (CMOS) was last updated in 2017 with its seventeenth edition. It details two ways to reference sources in documents: the first uses the parenthetical author-date referencing style and the second uses notes and a bibliography. Today we are going to focus on the CMOS author-date style of referencing, which is commonly used in science fields. 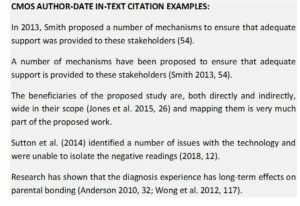 CMOS author-date in-text citations are located in the text in parentheses and state the name of the author(s), the year and the relevant page numbers. This referencing style does not use any punctuation to separate the author name(s) from the year; however, it does use a comma between the year and the page number(s). If there are multiple authors, then up to three authors will be listed in full. For references with more than three authors, the first author’s last name is given and then followed by ‘et al.’. If you are listing several references, then these are separated by a semi-colon and if there is more than one reference for the same authors and year, then these will be assigned a chronological publication order using letters after the year (e.g., 2018a and 2018b). As with all referencing styles, references are formatted slightly differently according to the type of source they are, so attention to detail and consistency is required in the reference section. 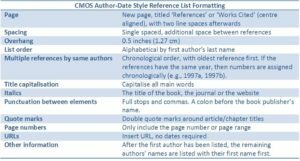 The CMOS author-date reference section begins on a new page with a centre-aligned title of ‘References’ or ‘Works Cited’. After two line spaces, the reference list begins in a chronological order with the oldest reference first. Each reference is single-spaced with an overhang of 1.27 cm and a line space separates it from the next reference below. This referencing style does capitalise each main word in the title of the reference. 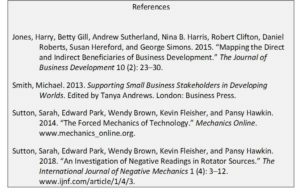 Different to the other referencing style we have looked at so far, in CMOS style the full name of each author is provided in the reference section. The first author has their last name given first, followed by their first name. The remaining authors have their first names followed by their second name. The Chicago Manual of Style, Seventeenth Edition. Available here: http://press.uchicago.edu/sites/CMOS_bookstore/index.html. A Manual for Writers of Research Papers, Theses, and Dissertations: Chicago Style for Students and Researchers, Nineth Edition. Available here: http://press.uchicago.edu/ucp/books/book/chicago/M/bo27847540.html. The Chicago Manual of Style Online: http://www.chicagomanualofstyle.org/home.html. The Chicago Manual of Style Online: Author-Date Sample Citations: http://www.chicagomanualofstyle.org/tools_citationguide/citation-guide-2.html. 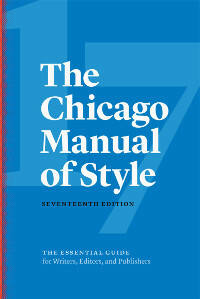 Purdue Online Writing Lab: Chicago Manual of Style 17th Edition: https://owl.english.purdue.edu/owl/resource/717/01/. 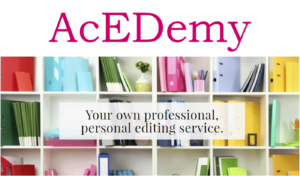 In the next AcEDemy blog post on referencing, we will be looking at the CMOS notes and bibliography style of referencing.